In some cases aquarium supplies & pond supplies are defined by their specific environmental purposes. For instance, fake rocks and decorative pumps are usually used in an aquarium, as they can be seen by the human owners or observers of the environment. Pond pumps are rarely decorative as they perform no visual or embellishing function. There are, though, many similarities between the two. Indeed in many cases the supplies required to keep an aquarium running and the supplies required to keep a pond healthy are essentially the same: the difference in use is merely one of scale. For the hobbyist at least, the aquarium is nearly always much smaller than the pond – and so the equipment used to keep it running is smaller and more delicate. The basic items needed to keep both pond and aquarium in good order are: pumps; filters; water testing kits; and some form of fish food. Plants may also figure in both environments, though their filtration functions (which are intermittent in the natural environment anyway) may be fulfilled by a well-designed pump and filter system. 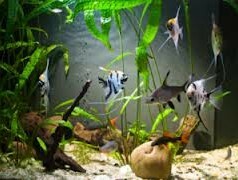 The purpose of all the major supplies required for pond and aquarium maintenance – with the exception of fish food, which is designed purely to deliver nutrition to the animals in the hobbyist’s charge – is to maintain and stabilise the nitrogen cycle. In the wild, this cycle is taken care of by the habitat –which is stuffed with organisms all interacting ecologically with each other, and which is further served by the refreshing action of tide or current. In an aquarium or pond, the balance of nitrogen or nitrogen derived compounds, all of which are lethal to fish, must be managed carefully. Fish excrete nitrates, which can lead to a build-up of nitrogen compounds in their environment. When these compounds exceed a certain level, the fish die. In natural environments, the excreta of fish are metabolised by bacterial species, which perform an ecological scrubbing function: one set turns nitrates into nitrites; and another set turns nitrites into less harmful compounds. The upshot of this is that fish, while potentially threatened by the presence of nitrogen derivatives in their water, actually need those derivatives to be there. Without them, the bacteria that feed on them wouldn’t be present: and so when the fish start excreting their own nitrates and nitrites, there’d be nothing around to scrub them clean. In a pond or aquarium, the nitrogen cycle must be managed with a careful addition of nitrogen compounds, which encourages a bacterial bloom. This is often done in an empty pond or aquarium, in the hope that the resultant bloom of bacteria will be enough to start scrubbing the fish’s excreta as soon as the animals are introduced to the environment. Water testing kits must be used frequently during this period to establish the safety of the environment for living fish. They must also be used continually, on a regularly spaced basis, to ensure that the nitrogen levels in the water do not exceed the scrubbing capabilities of the bacteria. Author Bio: Keith Johnson loves aquatic animals, especially fish. He has a fascinating range of fish in his aquariums and takes good care of them. In this article he is providing us with some valuable information on aquarium supplies & pond supplies.